The cycle of conferences is named "Leontief Readings" in honour of the Nobel Prize Winner in Economics Wassily Leontief, who gave his name to the Leontief Centre, the organizer of the readings. Every year in February the conference brings together leading Russian and foreign scientists, politicians, experts, discussing the theoretical concepts of the social sciences, problems of economic development and political and economic transformation of Russia. The main target audience of the conference, is the scientific, business and information community of Russia and St. Petersburg. 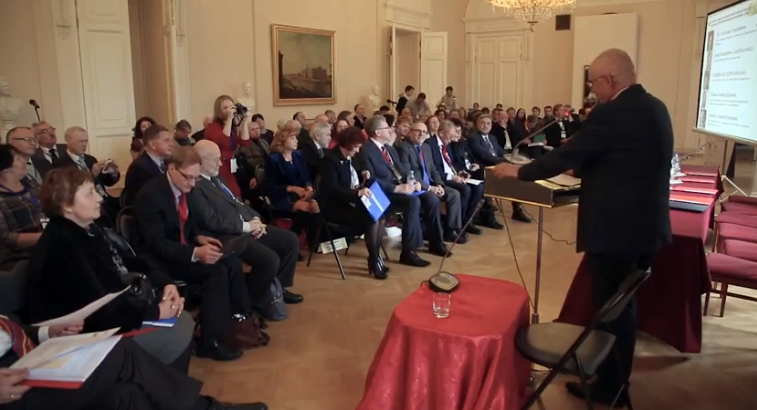 in the conference hall of the Leontief Centre, St. Petersburg. In February 2005 in commemoration of the 100th anniversary of Wassily Leontief the Public Committee on Awarding at the Leontief Centre decided to establish the International Leontief Medal in nomination "For Contribution to Economic Reforms". The Twelfth Ceremony of Awarding the laureates 2017 with the International Leontief Medal "For Contribution to Economic Reforms" took place on February 17, 2018 in the Mikhaylovsky (Ingenerny) Castle. The laureates 2017 are: Mart Laar, Chairman of the Supervisory Board of the Bank of Estonia and Dmitry Vasiliev, Managing Director of the Institute of Corporate Law and Corporate Governance. Interview with Harald Hagemann, Professor, Doctor of Economics of The University of Hohenheim - «Russian Prorok».